New Englanders have long appreciated Amtrak’s popular Downeaster train route, with its five daily round-trips between Boston and Portland, Maine. 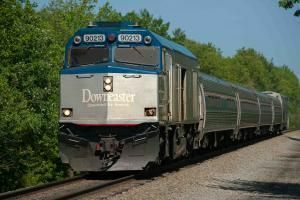 Families should note that kids 2-15 ride the Downeaster at 50% off the adult fare, and for a limited time through June 30, 2013, they travel for free on Sundays. This past November, Amtrak service was expanded and two daily round-trips between Boston and Brunswick, Maine were added. Brunswick is a charming college town in the picturesque Mid-Coast region. Shoppers are particularly keen that the expanded service means the train now stops in Freeport, Maine, home to L.L. Bean and a great variety of outlet shopping. To usher in this newly expanded service, the Northern New England Passenger Rail Authority has announced The Reel Experience Video Challenge. This contest offers winners some great prizes. All you need to do is videotape your onboard Downeaster experience and create a 2- to 2¼ – minute video that you upload to the site. Video submissions are due by noon on May 9, 2013. Slideshows are eligible too. Four prizes will be awarded, with one reserved just for college students. The Student Prize winner receives $500, two round-trip Amtrak tickets between Brunswick, Maine, and Washington, D.C. and an awesome GoPro camera, so the winner can continue making great videos of future travels. A People’s Choice Prize, to be voted on by the public on the Amtrak website, offers the same prize package. Fine print: Adults and students are eligible to win one of the two Grand Prizes, $1,000 plus two round-trip tickets between Brunswick, Maine, and Washington, D.C. on Amtrak Trains. What are you waiting for? Grab your video camera or phone and ride the rails to the beautiful state of Maine. You could be one of the prize- winners. For more information and a complete set of rules, visitAmtrak Reel Experience. Good Luck!